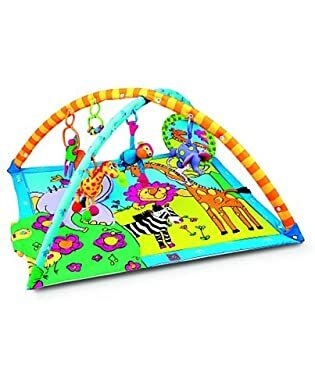 What Play Mat Gym Do You Have / Did Have? Discussion in 'Baby Club' started by Wobbles, Jul 28, 2007. Just wondering what play gym mats you girlies have? Robs sis gave us one of those, we let my brother have it for my nephew and he loved it! I have mamas and papas lotty ladybird one. Bethanie has this one: http://www.mamasandpapas.co.uk/product-7588634/type-i/ but I wish we'd got a more colourful one that grows with your baby as she found this one a bit boring at first.. it's only now that she likes it a lot (we did have it on the wardrobe for about 4 months though lol ) as we don't have any space here at my boyfriends parents house! It's very cute though and plays music, and the teddies are removable so Bethanie likes it! Yeah Wobbs it is nicely padded, but me and Dale debate whether or not its worth the money or not. He thinks not-typical man!